The most extreme example of this latter technique in Midnight’s Children occurs with the introduction of Indira Gandhi as virtually a character in the novel, identified as the Black Widow, with her real-life hairstyle, sharply distinguished black and white components, being held to represent the contrast between what she presented to the world and its underside. However I found this aspect of the book the least convincing, and indeed Indira Gandhi made the limitations of this sort of approach clear when she sued Rushdie, not about the general criticisms, but the insinuation that she had been responsible for the death of her husband. She won the case, and in fact the book is remembered now not so much for Rushdie’s criticism of her period of Emergency Rule, but rather for its incisive account of the first few years of Indian independence, culminating in the wars that finally put paid to the idea of Indian and Pakistani parity. The protagonist of the book is Saleem Sinai, born at the moment India achieved independence, and thus endowed with supernatural gifts, along with the other children of midnight. However he is not really the son of his putative parents, since his ayah, in a fit of egalitarian idealism, switched him at birth with the son of a poor woman, who had been impregnated by an Englishman about to leave the country. The real Saleem Sinai is brought up in the slums and becomes a criminal, who ends up as a Congress Party thug at the time of the Emergency. Apart from this incisive glimpse of the pluralistic reality of the beneficiaries of independence, several other images make clear Rushdie’s analytical skill. One of the most memorable was the account of the departing Britisher allowing Saleem’s parents to buy his house for a song, provided they agreed to change nothing in it. Supplementing this vision of the straitjacket in which the British bound India through procedural rules is the account of how Americans contributed to the language riots that nearly tore India apart in the fifties. The trope here, matching the much less formal way in which influence was exercised, takes the form of a girl who happens to live there with her family, and manages to create confusion that could have been resolved easily without her. Rushdie’s next novel, Shame, dealt with Pakistan, and specifically the rivalry between Bhutto and General Zia, who overthrew and then executed him. This time the technique involved characters who were very obviously based on the two rivals, with clearly identifiable personal and political traits, the sexual antics and volatility of Bhutto, the puritanism and dogged determination of Zia. The novel, written in 1983, also introduces Benazir Bhutto as the Virgin Ironpants, who inherits the country in time, in a prophetic account that suggests too that she might have been more successful had she not married. These two brilliant books, that provided valuable insights into the contemporary politics and social issues of the subcontinent, were followed by The Satanic Verses, which brought Rushdie notoriety of a very different sort. The book is in two distinct parts, one dealing with contemporary Britain from the viewpoint of two immigrants from the subcontinent, the other with a historic character who is a parody of the Prophet Mohammed. 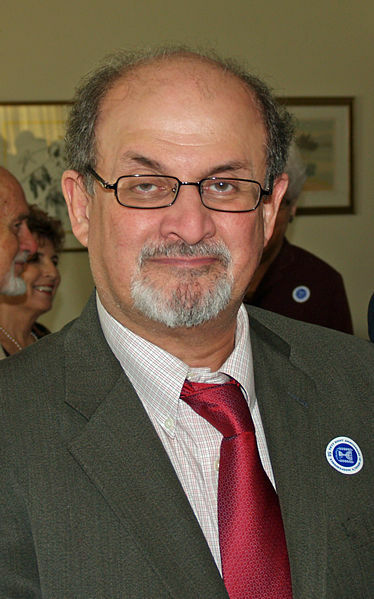 The latter portrait drew down the wrath of the Iranian government, or rather its Supreme Leader Ayatollah Khomeini, who issued a fatwa, essentially a sentence of death, on Rushdie. This was an extreme measure, and I think unnecessary since, while Rushdie was certainly not respectful, his target was not the religion nor its founder, but rather the whole notion of dogma that cannot be questioned. This parallels his target in the modern part of the novel, which is Thatcher’s Britain, and its rigid classifications with regard to race and class and the characteristics associated with them. Sometimes I think the Ayatollah’s extreme reaction was entirely due to Sri Lanka. We were I think the first country to ban the book, along with the film ‘The Last Temptation of Christ’, in what was clearly an election measure in 1988 designed to attract Muslim and Christian votes. I was in Pakistan at the time, and interviewed on the subject on Pakistan radio, when we were able to discuss the book freely. But then Pakistan had to go one step further, and not only ban the book, but I think burn copies of all Rushdie’s books in the country. This left Iran no option but to make its indignation even more dramatic, with unfortunate consequences for Rushdie. One of these was that the danger to his life made him dependent on the British government for protection, so in time the scourge of the British establishment became a votary, being awarded a knighthood in fact in 2007. However, though Rushdie has mellowed, he has still been critical when required, opposing for instance the Anglo-American attack on Iraq, though to my mind rightly supporting the UN invasion of Afghanistan following the Al-Qaeda attack on the Twin Towers. His subsequent fiction, though always exciting and thought-provoking, has not been as brilliant as the earlier work. He has dealt with racism and terrorism in India and elsewhere, with the world of rock music, with colonialism and power relations, even with international intrigue in New York and the countries of the Pacific that have been playthings for individual ambitions that cater to the highest bidders – but all these have somehow been less immediate than his plunge into subcontinental politics and the frontal assault on dogma that he engaged in at the height of his powers. The achievement is colossal, given not only the impetus he gave to magic realism but also the encouragement to what used to be called Commonwealth Literature and now has greater philosophical weight as Post-colonial writing. But I hope there is still something in him that will equal the achievements of the early eighties, given the exuberance of his writing and the strengths of his critical analysis.